Some of you may have noticed that something looked a little different in my last three posts. You guessed it, we finally painted our living room (and repainted the entry room as well.) When we first moved here about four years ago, every room in our new home was a different color. And when I say different color, I don't mean a different neutral color. I am talking about reds, blues, greens, oranges, etc... and the two-toned doors (we won't talk about the two-toned doors!) I called it our Skittle house because it had every color of the rainbow going on throughout. Well, before I moved any of our belongings in (they sat in the garage for the first week.) I set to work at painting every room in our home. From downstairs to upstairs, every wall, every piece of trim and every door was painted, sometimes up to five coats (white over red really was a tough one!) I didn't have time to select any colors so we just purchased several five gallon buckets of Antique White by Dutch Boy and went with it. When it was finally time to paint the living room, I couldn't go a step further. I was so sick of painting that when I looked at the brown and tan walls of the room, I thought good enough for now! We lived with those colors until a couple weeks ago, and I thought it's time. I am loving the new look! The white walls now go with the rest of our rooms. It feels bigger and brighter in here too. A fresh new look, just in time for spring! A vintage trophy on my coffee table corrals all our remotes. 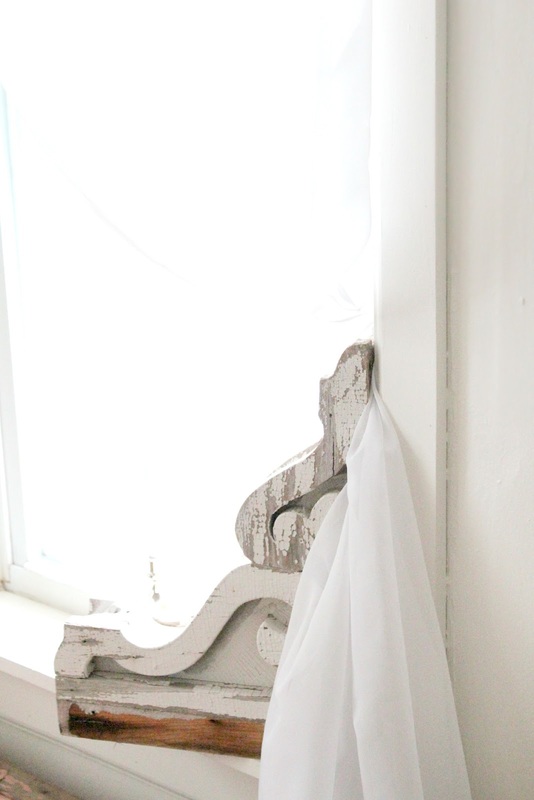 To hold back the sheer curtains, a pair of old, chippy corbels does the trick! And yes, those are Paperwhites! I know what you are thinking... aren't you a little late for Paperwhites? Aren't they usually forced during the holidays? I like to start mine just after all the Christmas decor comes down. I love gardening and these are just a promise of the growing season to come. 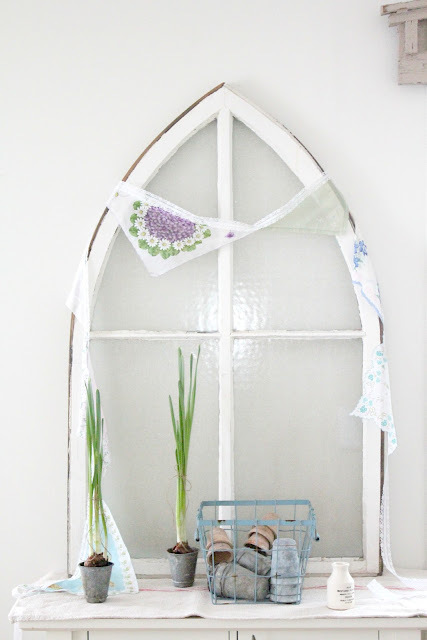 I like to incorporate them for a fresh look in my spring decor. 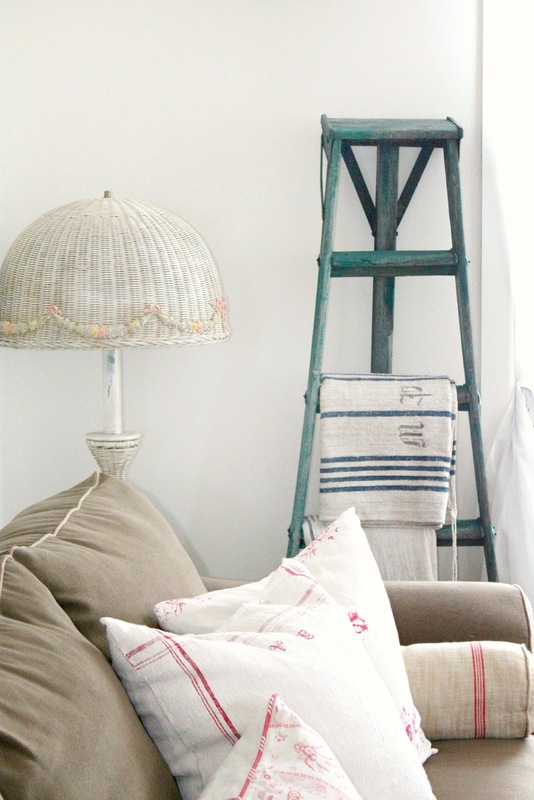 An old orchard ladder catches some vintage grain sacks. You might recognize this french metal basket. I used it at Christmastime as a tree base. 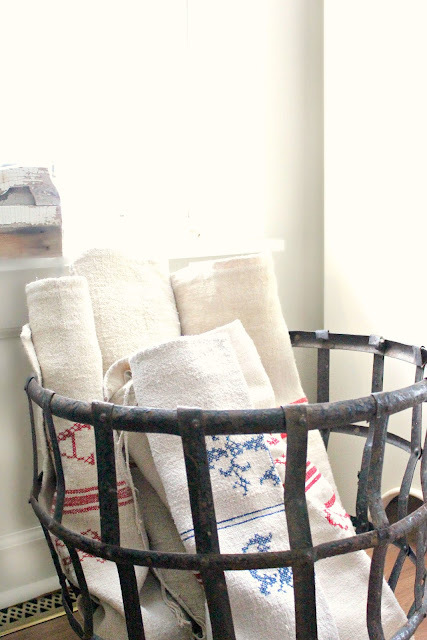 These old metal baskets were used to ship wine jugs. 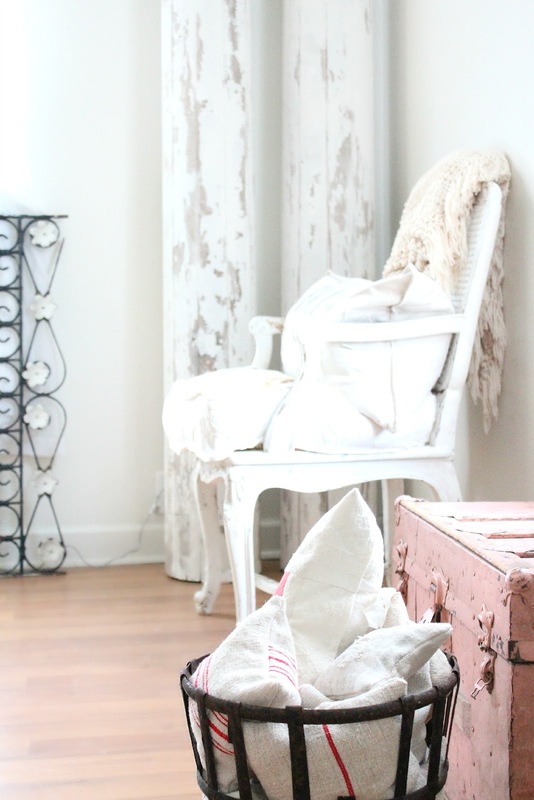 Of course it came from one of my favorite places to shop, Dreamy Whites! Thank-you to all of my new followers. I appreciate all of you! I added Linky Followers and Networked Blogs, two ways to follow after Google makes it's changes. And I am also now on Facebook. Feel free to follow along any way you choose, I would love to have you! ... AND you are still my blog pick of the month for one more glorious day!!! It looks simply beautiful Maria!! 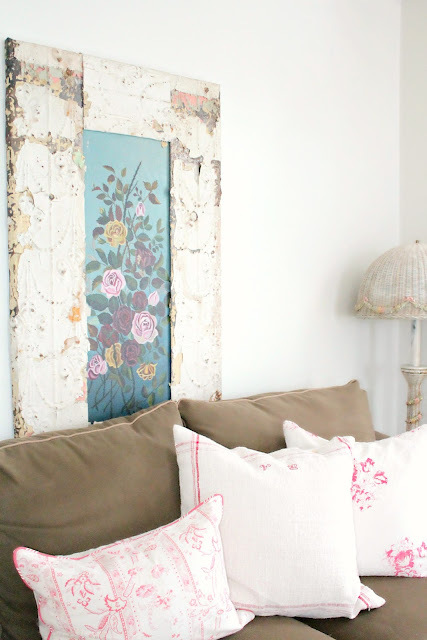 The chippy headboard piece will look so beautiful in your home! GORGEOUS! just gorgeous. It has such a calm feel to it and all the soft colors show so beautifully. Happy early spring! 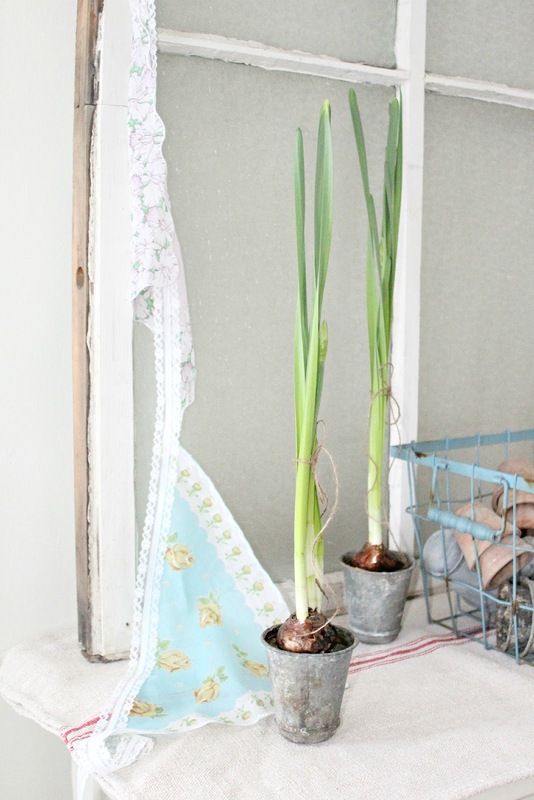 I just planted paperwhites too...they are more spring than holiday to me. Your living room is beautiful....I love the new wall color! Just so fresh and wonderful! I absolutely hate to paint, so I truly felt your paint explaining you had "hit the wall," so to speak and could paint no further. Your rooms - and your photography - amazing. Just lovely Maria! So much inspiration in this post! 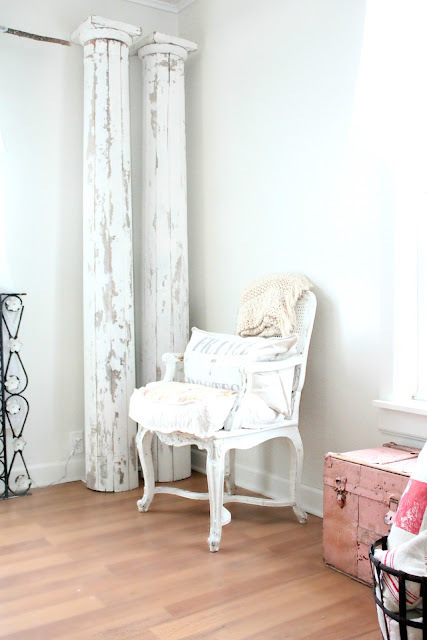 I love the two tall white beams and have been on the lookout for some for quite some time. Architectural pieces are awesome! Everything looks so Beautiful! The walls look so fresh and new, makes everything pop! I love your photos. Everything looks so pretty. Isn't it wonderful when painting is complete, everything looks so fresh and clean. Painting is also on my to do list very soon! Sooooo beautiful!!! I LOVE the Armoir!! I so want one:) Love paperwhites to:) My kids and I bought some after Chrsitmas for half off and grew some more. So nice to grow flowers this time of the year as we so want spring to come! I love Dreamy WHites to and have bought from her. SHe has the nicest treasures!! Have a wonderful day and enjoy the weather today as we are going to get hit tomorrow!! You did a fantastic job on your living room. Those pictures look like from a magazine, so pretty! it is simply perfect !!! Your living room looks so fresh and beautiful. 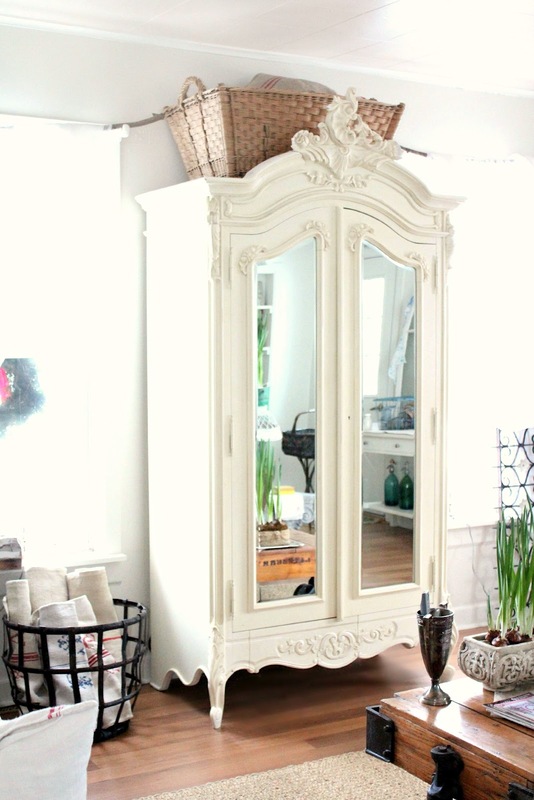 Your mirrored armoire is gorgeous! So much charm, so warm, so inviting!! I have a very similar gothic window, but what I really want is that armoire! Georgeous! I'm your newest follower. I also live in an almost century old home, but haven't had the courage to paint everything...yet. I'll follow along and maybe get inspired enough to grab the bucket of primer and get to work already. You have a lovely home. Such a beautiful room! So well done! Such an amazingly beautiful room! I could look at these pictures all day long! You have a fabulous room here! Thank you for sharing every little detail with us! 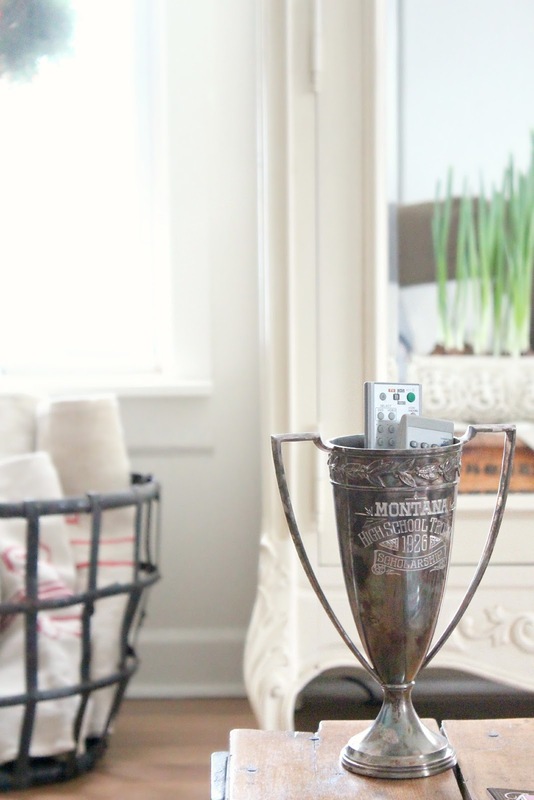 The trophy coralling your remotes and the amazing French armoire are my favorite pieces! The wall color is perfect! 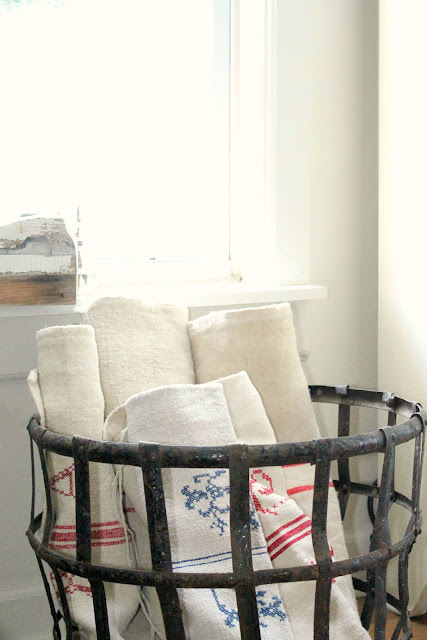 Your use of vintage linens is wonderful. As someone that currently lives in France, I love seeing these put to use! Beautiful! 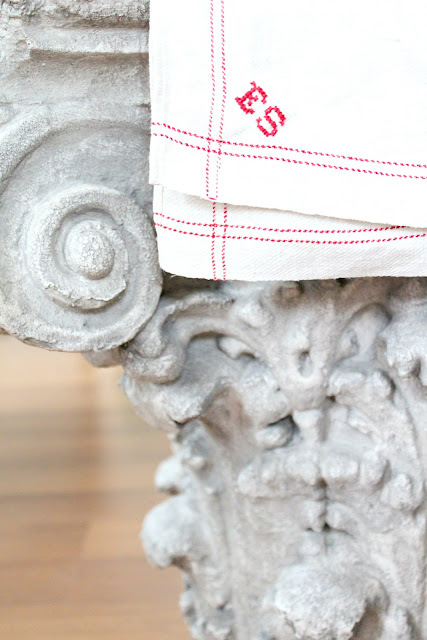 Love the linens, they look like they have some cross stitching on them. You're inspiring me to get on with my room painting! beautiful Maria. You have inspired me again! I have been trying to make the time to paint the hallway white. Think I will conquer it this weekend. I have gone so far as allowing my daughters to paint their initials on the walls in white to get my you know what in gear! Have a good one! I visited your blog today = I saw you on 'Peeking through the Sunflowers.' Your blog is so pretty and charming. I love all the red hearts. Me and my daughters started a blog, and we would love it if you could visit us and follow. I would enjoy coming back to visit with you. 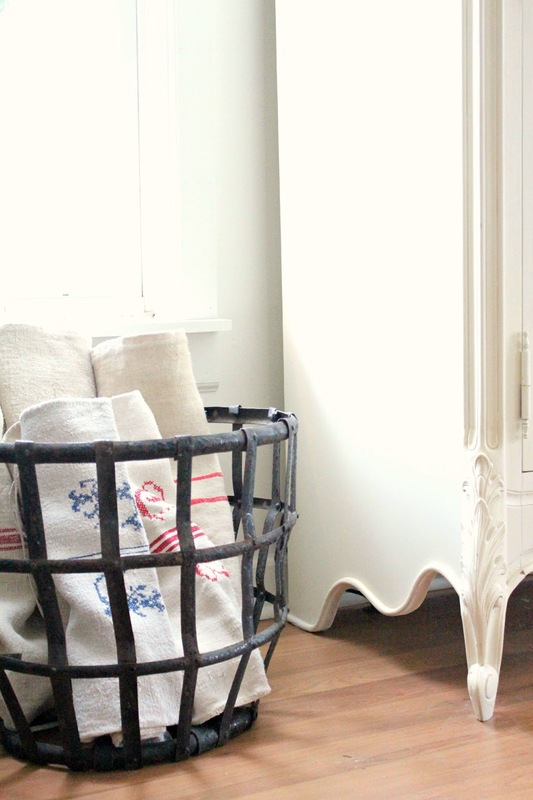 Your blog is filled with simplicity and beauty. I hope to hear from you, and have a lovely evening. Love the new look!!! Your home is always nothing short of gorgeous!! LOVE it ALL!!! Wishing you a marvelous week, my dear friend! Wow!!!! Found you on pintrest. Newest follower. Would love to have you link up at my party too, starts tonight. It looks absolutely beautiful. I can't wait to check out the rest of your blog. I love everything about this room. It is all gorgeous. I want your armoire. I will find one some day. Thanks for sharing at Wow. I'm loving the new white walls and everything in it--thanks for sharing! Pretty blog! I'm glad I found you! Just found your blog! It's gorgeous!! Absolutely beautiful! Thanks for sharing. Your new paint color makes the room look so fresh. I just found your blog and I love it already! Gor-ge-ous!!!! New follower here! Absolutely beautiful! I loved seeing your gorgeous living room! Your living room is beautiful. 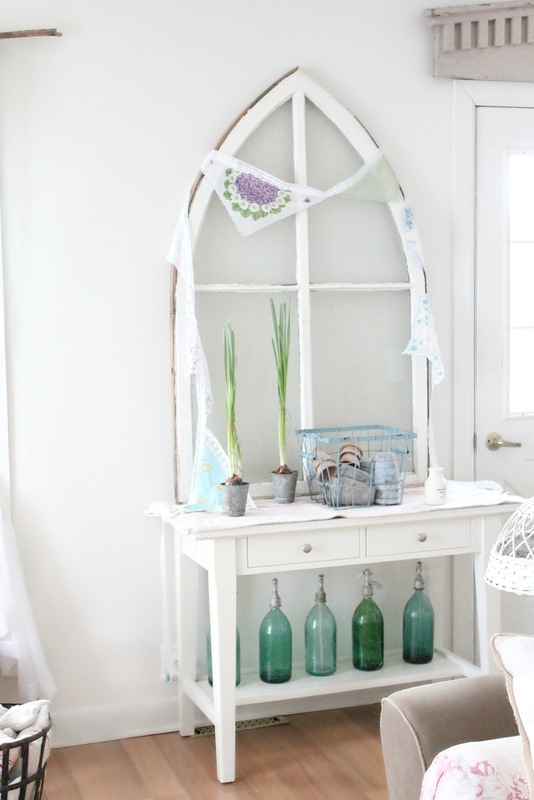 Love the soft color palette. Your furnishings are divine... especially love the tall roman columns, the 'cathedral look' window frame with glass and the chippy corbels. Visiting from WOW Party and thanks for sharing. What a beautiful home. 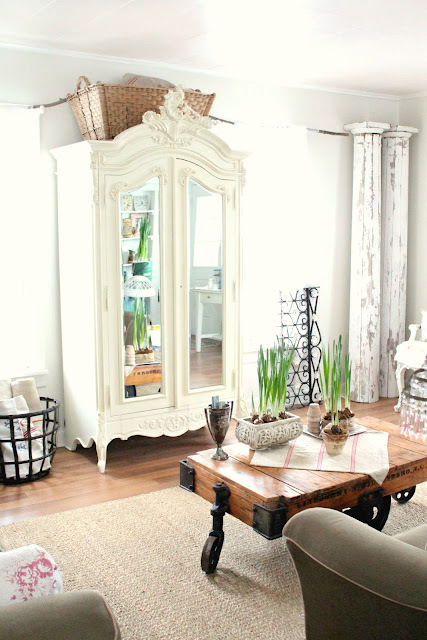 I just love your rustic style and impeccable taste. I'm here from Kim's party and your newest follower. Looking forward to going back and browsing some of your older posts. Pop over for a visit sometime! Looks amazing.I am following from WOW at savvy southern style.I am also your newest follower linking up on all venues. Absolutely beautiful! 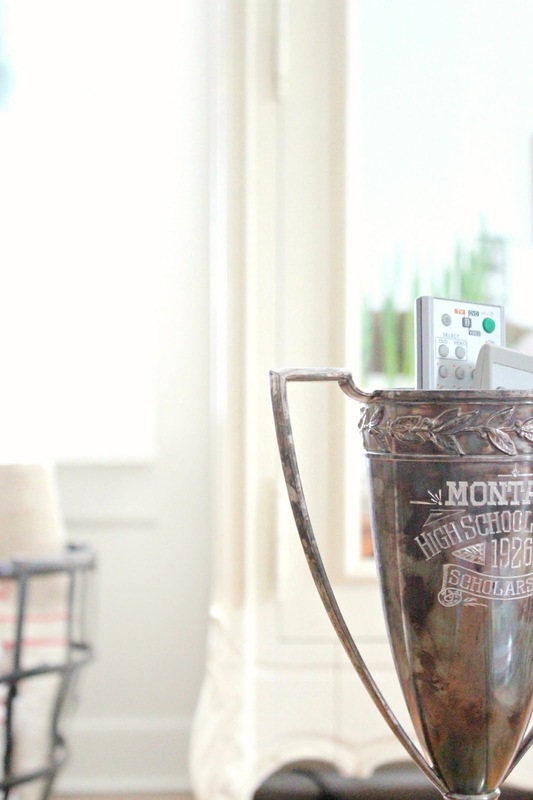 I really love the idea of using a trophy cup to hold the remotes....too cute and ingenious. I am your newest linky follower and would really appreciate it if you would follow me back. Hi! Just found your blog and love it! (hate to follow that up with a 'but'...) but everything is too light to read...dont know if its just coming across that way on my computer or what??? The room is just stunning, every inch of it is just gorgeous! Thanks for linking up! Beautiful! I love your house. Everything is so light and fresh! I know what you mean about being sick of painting! I have been painting a table and chairs for what feels like forever! This post makes me want to get it over with so I can go on to other parts of my house. Thank you for sharing! 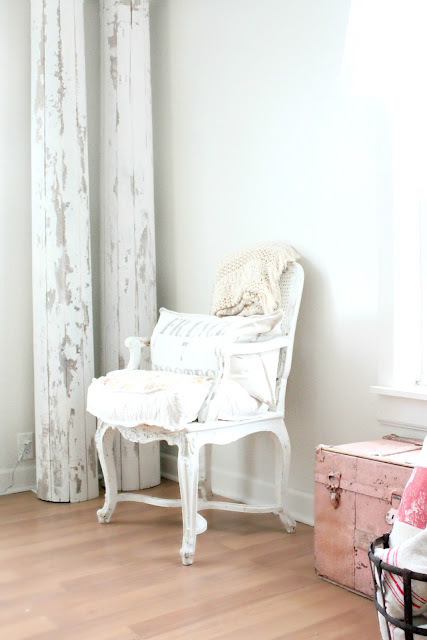 Maria, So I am planning a living room paint VERY soon and have been debating on a light grey or white...can you tell me did you go with the Dutch Boy Antique White in your room to match the rest of the house? I would love to know. Thanks in advance! New to your blog! 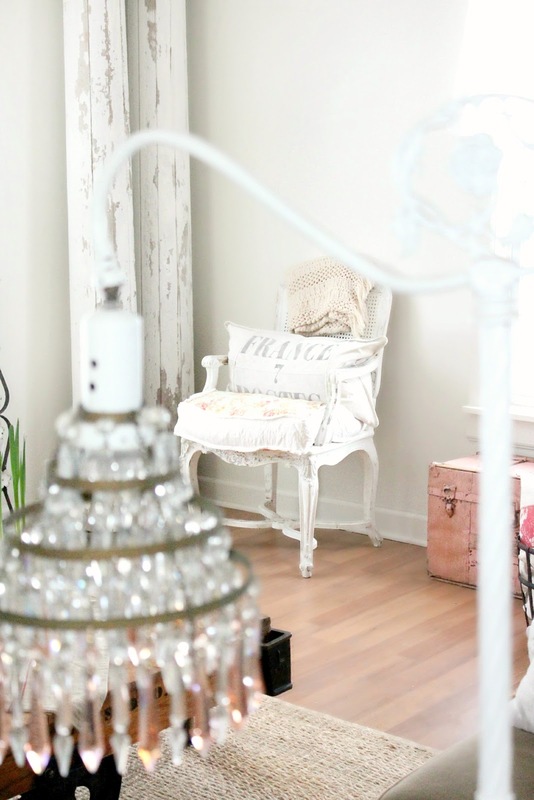 Loving your style...fresh new look with a vintage richness! You have quite an eye for the delicate mix, in my opinion, between french country romance and rustic antique appreciation! LOVE IT!